from the age of 8 and above. Optimus Gaming is a virtual reality Studio that offers a "friendly instructor service" which makes virtual reality experience extremely easy & fun to do. WA Schools can Experience the future of education in a Virtual Reality Demonstration by Optimus Gaming, Perth’s No.1 VR Studio, using some of the latest VR technologies available in the market today. We can provide a broad scope of works using a range of VR design and development experts working alongside project management, training and marketing professionals to develop your VR content in marketing, training, VR experiences, modelling and gaming. Our team can create incredible VR experiences for different engines and hardwares such as HTC Vive, Unity 3D, Unreal Engine. Virtual reality (VR), also known as immersive multimedia or computer-simulated reality, it is a computer technology that replicates an environment, real or imagined, and simulates a user's physical presence in a way that it allows the user to interact with the virtual environment. Virtual reality artificially creates a sensory experience, which can include sight, touch, hearing, and smell. Most up-to-date virtual realities are displayed on an HD VR special stereoscopic displays, and some simulations include additional sensory information and focus on real sound through speakers or headphones targeted towards VR users. Virtual reality covers remote communication environments which provide virtual presence of users with the concepts of telepresence or a virtual artifact (VA) either through the use of standard input devices such as a keyboard and a mouse or through multimodal devices such as a wired glove or omnidirectional treadmills. The immersive environment can be similar to the real world in order to create a lifelike experience—for example, in simulations for pilot or combat training. Transform your whole body into a gaming controller and get ready for an immersive virtual reality experience. Have you ever wanted to drive like Lewis Hamilton or Sebastian Loeb? Here is your chance to drive like a pro. Choose your favorite car and try not to crash. We accept only full payments for the bookings. If you cancel or move your booking with less than 48 hour notice your payment will not be refunded. If you are drug or alcohol affected, you will not be allowed to play and refund will be declined. 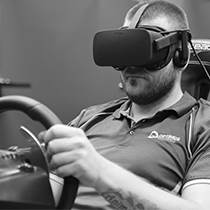 Sign Up for Optimus Gaming Membership and you will get all your VR sessions -20%. Note that experience can be booked hourly only. Bring one of your mate and split the hour of gaming! Maximum of up to 8 VR Booths per session. Virtual Reality experience can be the greatest and most immersive gift that you can give to a friend. Maximum of one person per voucher. 2 dimensional words can't describe being introduced to virtual reality, Thank you Optimus Gaming! Brilliant! Thanks boys for the experience i will definitely be doing it again. Attended today with a group of 7 players, full thanks to Chris and Deiter (hope I spelt it right!) for their wonderful service coping with us during their early days! We all had an absolute blast and I've got members just from today already booking in more sessions. Thanks so much for your patience and for giving us the best VR experience in Perth! Will definitely let everyone know about your business. All the best guys! We'll be back again soon! Awesome experience. Will recommend it to everyone! Fantastic experience with great service! Will go back for sure!! Had an awesome time with Hayden Longfield. Will definately go again. Kids had such a great time, we will definitely go back! Fantastic experience. I will be going back. Went with two of there today and it was awesome. First time playing vr and the guys were really helpful and all the gear worked well. Even tried out the driving simulator which is a bit to much for my head but you would get used to it. I really recommend people go and support this place cos its great fun, either by yourself or in a group. Just went to Optimus Gaming in Balcatta to try out VR with touch controllers for the first time. I've had the Oculus Rift for quite a while and I gotta say, the touch controllers add a new dimension to VR. The interactivity with the virtual world made even menial things, such as batting balloons, feel quite fun. I had heaps of fun within the hour I booked and I only played 2-3 games out of their sizable and growing library. I definitely recommend checking the place out and exploring their library of games. You won't find an experience like it elsewhere. Register for our DEMO DAY! Get 15min playtime for FREE!